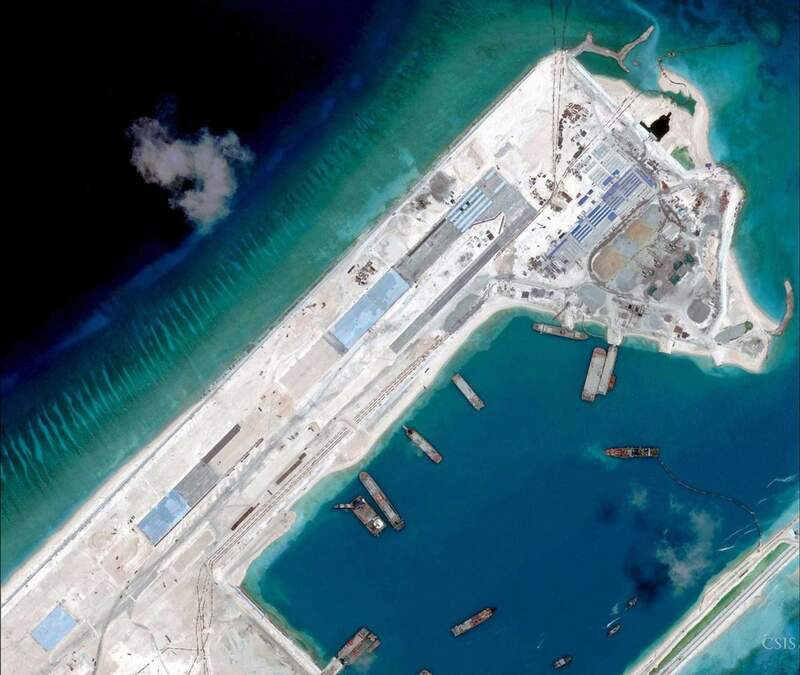 China has completed a 10,000 foot runway on a reclaimed island in the South China Sea, according to a new round of satellite photos released Friday. The completed runway on Fiery Cross Reef could soon be operational and accelerate additional construction on the reclaimed island, according to a Friday report in Jane’s Defence Weekly. The island in the Spratly chain is in a central location in the South China Sea about 400 miles from Vietnam, Malaysia and the Philippines and a likely key component of the China’s South China Sea strategy. “Fiery Cross Reef is the most extensive new landmass built by China in the Spratly Islands and is believed to be the future hub for its operations in the southern reaches of the South China Sea,” read the report. In addition the runway, the Fiery Cross installation also appears to have a deep water port and could serve as a logistics hub for the People’s Liberation Army Navy warships. The installations are the practical expression of China’s claim to sovereignty of the South China Sea which is disputed by neighboring countries as well as the United States. “By giving China the means to enforce its expansive ‘dashed-line’ claim, the new islands also challenge international law, specifically the United Nations Convention on the Law of the Sea (UNCLOS),” according to Jane’s analysis. In a Senate hearing last week, U.S. officials expressed concern over China’s island building camping and its potential to change the balance of power in the region and a potential expansion of presence and freedom of navigation missions in the South China Sea. “Preventing the Chinese from further militarizing those features a range of options — including freedom of navigation exercises — and we’re considering those options now,” the Assistant Secretary of Defense for Asian and Pacific Security Affairs David Shear told the Senate Armed Services Committee (SASC) last week. U.S. Pacific Command commander Adm. Harry Harris gave the SASC his assessment of what militarization of the facilities might mean. “If you look at all of these facilities — and you could imagine a network of missiles sites, runways for their fifth generation fighters and surveillance sites and all that — it creates a mechanism in which China would have de facto control over the South China Sea in any scenario short of war,” Harris said.